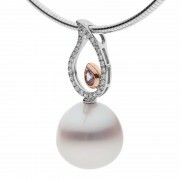 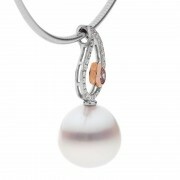 ‘Tahlia’ meaning ‘Dew of Heaven’ inspired this teardrop design pendant. Complete with a stunning Argyle pink diamond and a perfect South Sea pearl, this piece is a true heirloom to be adorned for generations to come. The open frame design sits stunningly against the skin and the dusty pink tone of the pink Argyle diamond is soft enough to match any outfit, day or night.